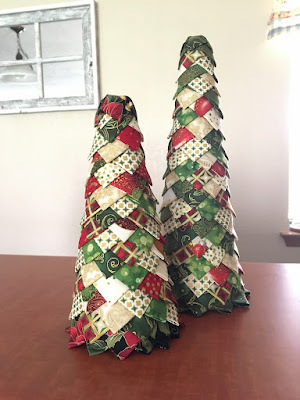 Fall of 2015 I saw a picture of "quilted" Christmas trees on Craftsy. I saved the project and the fabric requirements. The instructions list a youtube video that is no longer available. With the information I had, I figured out how to make these trees. 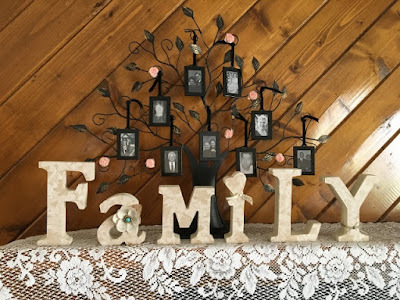 Sometime around the time that I saw the idea on Craftsy, I bought the styrofoam trees with the intention of making it. I bought fabric for it last year but still didn't get them made for Christmas. I've had it on my "to do" list all month. My reasoning is that I have more time now than I will in November. Surprisingly, It took me about 5-6 hours to make these two trees. I didn't think it would take so long. The taller tree has a 4" base and is 12" tall. The smaller tree has a 3-1/2" base and is 9" tall. I don't have a lot of decorations for Thanksgiving. I usually stick with the fall leaves and pumpkins. I have a stuffed fabric turkey and some pilgrims and Indians someone gave me as a gift years ago. I thought it would be nice to add something to my Thanksgiving stash. Like the other projects I shared this week, I painted the wood pieces first and then I cut the paper and mod podged it on. I must admit, I wish I had some sort of a template for the leaves. I could have made one but I didn't take the time. In some ways I wish I'd taken the time but I'm okay with how it turned out. 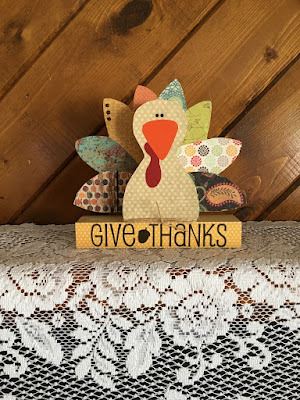 Honestly, no one is going to sit and stare at the turkey feathers and think, "ooh that one needs to have more of a curve." Well, you might now that I pointed it out. haha. I did this the same way as the "family" letters. I traced the blocks onto paper, cut it out and mod podged onto the wood blocks after painting them. I like the paper for these blocks. The black paper is soft and fuzzy. Down side is it picks up lint like crazy. 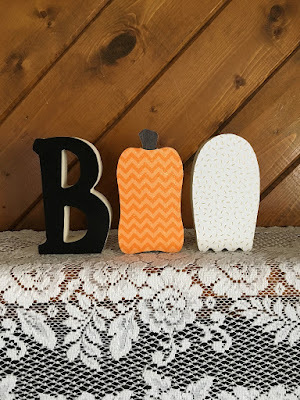 haha The pumpkin is sparkly chevron paper and a wood grain for the stem. The ghost is white paper with gold sprinkles all over it. This will be a fun decoration for October! Our ward here doesn't do a super Saturday and I'm wanting to make some new things for our home. I bought several different projects to work on one Saturday. This is the first project I put together. I painted the letters. I didn't distress them but that would look nice too. I traced the letters onto scrapbook paper, cut the paper and mod podged it onto the wooden blocks. I glued on a flower on the "a", tied some crocheted ribbon on the "i" and used some hemp and a brad at the bottom of the "y". I love the way the letters turned out. It would be fun to use different papers on the letters but I wanted them to match and be used on the mantle and as a display for lessons in the future.